Kaplan-Meier analysis is a widely used method to generate and analyze survival-time data. 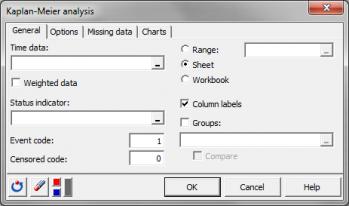 It is available in Excel using the XLSTAT statistical software. The Kaplan-Meier method, also called product-limit analysis, belongs to the descriptive methods of survival analysis, as does life table analysis. 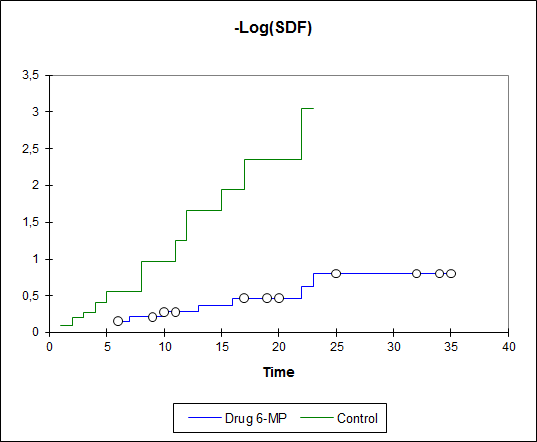 The life table analysis method was developed first, but the Kaplan-Meier method has been shown to be superior in many cases. Kaplan-Meier analysis allows you to quickly obtain a population survival curve and essential statistics such as the median survival time. Kaplan-Meier analysis, which main result is the Kaplan-Meier table, is based on irregular time intervals, contrary to the life table analysis, where the time intervals are regular. Kaplan-Meier analysis is used to analyze how a given population evolves with time. This technique is mostly applied to survival data and product quality data. There are three main reasons why a population of individuals or products may evolve: some individuals die (products fail), some other go out of the surveyed population because they get healed (repaired) or because their trace is lost (individuals move from location, the study is terminated, among other reasons). The first type of data is usually called failure data, or event data, while the second is called censored data. The Kaplan-Meier analysis allows you to compare populations, through their survival curves. For example, it can be of interest to compare the survival times of two samples of the same product produced in two different locations. Tests can be performed to check if the survival curves have arisen from identical survival functions. These results can later be used to model the survival curves and to predict probabilities of failure. Events: number of events recorded. Proportion failed: proportion of individuals who "failed" (the event did occur). Survival rate: proportion of individuals who "survived" (the event did not occur). 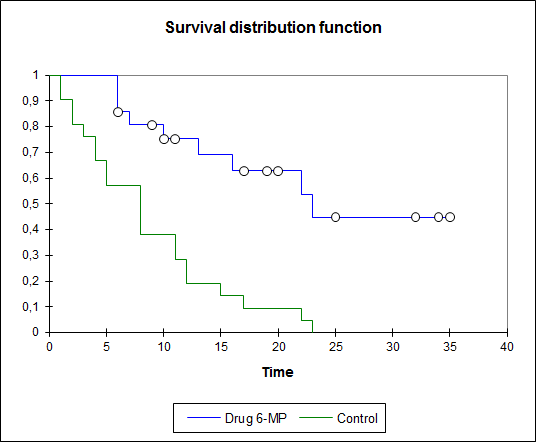 Survival distribution function (SDF): Probability of an individual to survive until at least the time of interest. Also called cumulative survival distribution function, or survival curve. Survival distribution function standard error. Survival distribution function confidence interval. Mean and Median residual lifetime are computed and displayed into two tables. A first table displays the mean residual lifetime, the standard error, and a confidence range. A second table displays statistics (estimator, and confidence range) for the 3 quartiles including the median residual lifetime (50%). The median residual lifetime is one of the key results of the Kaplan-Meier analysis as it allows to evaluate the time remaining for half of the population to "fail". These three approaches give similar results, but the last ones will be preferred when samples are small. These tests are based on a Chi-square distribution. The lower the corresponding p-value, the more significant the differences between the groups.